Mayo Clinic has a rich history within the nursing profession and continues to strive to "provide the best nursing care in the world." And there are several exhibits located on Mayo Clinic's Rochester campus that honor and recognize contributions to the nursing profession. For those of you traveling to Mayo Clinic's Rochester campus, I encourage you to visit the "Forever Caring" sculpture in the Mayo Nurses' Atrium located in the subway level of the Gonda Building. The sculpture was dedicated in 2003 to honor the nursing profession's past, present and future colleagues. The sculpture was designed and sculpted by Gloria Tew and made possible through the philanthropic generosity of Warren F. and Marilyn J. Batemen. The figures portray both the women and men of the nursing profession. Nurses in advanced practice, education and research, the threefold mission of Mayo Clinic, are exemplified in the nurse anesthetist, the graduate nurse and the nurse with a patient's chart. 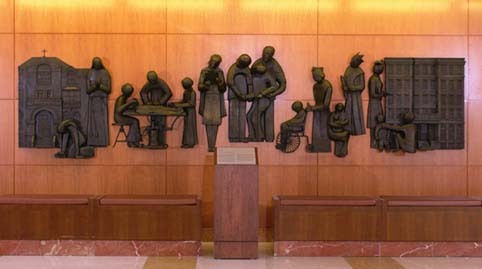 The "Forever Caring" sculpture is just one of the exhibits honoring nursing professionals at Mayo Clinic. The most recent nursing exhibit was unveiled in Heritage Hall located on the street level of the Mayo Building. The exhibit features a flag and a plaque to honor and to recognize all nurses for their service to our country in caring for patients in the military. This gift was presented to Mayo Nursing by Dr. Walter Franz. A little known nursing display also exists in St. Marys Hospital on the main floor of the Francis Building, in room M-4. This historical display is located directly across from the visitor's cafeteria and includes both nursing archives and operating room instruments from the past. The items range from a nursing diploma signed by Drs. Will and Charlie Mayo to an ether bottle used by Mayo Clinic's first nurse anesthetist, Edith Graham (Mayo). I encourage you to take a few minutes to walk through this small but intriguing historical nursing display if you visit Mayo Clinic's Rochester campus. Mayo nurses continue to strive to "provide the best nursing care in the world." Please feel free to share any comments you may have about these nursing displays or the nursing care you have received at Mayo Clinic. Mark LaMaster is a nursing placement coordinator in the Department of Nursing.